Concordat Watch - Italy | �Margin of appreciation� permits crucifixes in Italian state schools (2011), a niqab ban in France (2014) and a general erosion of human rights. The European Court of Human Rights is meant to protect individuals from human rights violations. 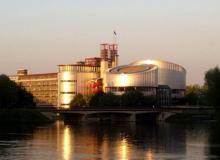 It was established at Strasbourg on the Rhine by the 1950 European Convention on Human Rights (ECHR). Article 46 says that states must “abide by the final judgment of the Court in any case to which they are parties”. The ECHR ruled that the display of crucifixes in Italian state schools did not violate the rights of non-Christian students. This overturned an earlier judgement known as Lautsi versus Italy. The final ruling loosened the application of human rights by saying that the classroom crucifixes came within the “margin of appreciation” given to individual countries, in accordance with their customs. In 2005, when the Italian Administrative Court refused turned away the parent who objected ot the classroom cross, it argued that the crucifix was an expression of Italian cultural heritage. This argument found resonance. It has been said that in Italy supporting “Christian heritage” has become a code word for opposing (Muslim) immigration. And, indeed, until the expansion of the EU in 2004 North Africa was the source of the largest group of immigrants to Italy. The Church appears to have sought to make this connection, perhaps as part of a larger strategy of keeping Turkey out of the European Union. 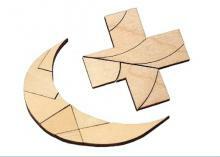 Love of the cross or fear of the crescent? 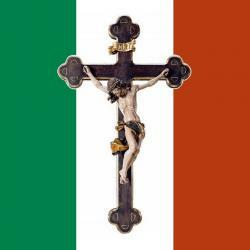 An Italian claims that his countrymen’s support for the crucifix is as much about immigration as it is about religion. Following the refusal of the Italian court to accept her application, Ms Lautsi complained before the European Court of Human Rights that the display of the crucifix in the State school attended by her children was in breach of two articles of the European Convention on Human Rights. These were Article 9 (freedom of thought, conscience and religion) and of Article 2 of Protocol No. 1 (right to education in accordance with the parents’ beliefs). In its judgement of 2009 the ECHR largely supported her. With the aim of getting this unanimous ECHR judgement reversed, Italy launched an appeal and an international campaign was begun to back this up. This brought results. In 2011 the Grand Chamber of the ECHR overturned the crucifix ban. The Court found no violation of Ms Lautsi’s right to educate her children according to her own beliefs, since they were not being indoctrinated by merely being exposed to a crucifix on the classroom wall. From this it followed that the right to freedom of belief had not been violated. Furthermore, when it came to displaying religious symbols, there was great diversity within the European Union and, so long as human rights were not being infringed by any of this, it was not the Court’s job to enforce uniformity. Each country has a “margin of appreciation”. The “margin of appreciation” appears in the very first judgement handed down by European Court of Human Rights in 1961. There the Court said that a state, (Ireland), had a margin of appreciation “in determining whether or not there is a public emergency threatening the life of the nation.”  However, after being introduced to give states some discretion in judging their own national security needs, margin of appreciation is now increasingly invoked in connection with religious beliefs. The involvement of third parties marks a departure from the strictly adversarial nature of the justice system where testimony was made on behalf of either the complainants or the defendants. The traditional practice is designed to air both sides. However, sometimes a problem has more than two sides. This is especially likely when courts such as the ECHR are called upon to decide legal questions of major public importance, with implications going far beyond the facts of the case at hand. Here third parties may be able to highlight aspects not raised by the two adversaries. This is why the right for third parties to intervene, as article 36, is written into the European Convention on Human Rights. Ten states chose to use this provision to appeal against the crucifix ban as third parties: Armenia, Bulgaria, Cyprus, Greece, Lithuania, Malta, Monaco, Romania, the Russian Federation and San Marino. Counting Italy, as well, this showed the Court that 11 out of the 47 Member States of the Council of Europe were publically opposed to the banning of crucifixes in the classrooms of state schools. Given the Court's dependence on the voluntary cooperation of the Member States, the opposition to its verdict may have given the justices reason for pause. The ruling was handed down on 3 November 2009 and the reaction was swift, with Bavaria firing a salvo the very next day. Among the EU countries only Spain was depicted in the news as supportive of the ECHR ruling against the crucifix, while Austria wondered how to reconcile the ban on crucifixes in the classroom with the concordat guarantee for them, and Poland and Slovakia joined Bavaria in opposing it. In other words, within weeks of issuing its 2009 ruling, the ECHR found itself with a Europe-wide rebellion on its hands. Under these circumstances it is easy to see how it could become necessary for the ECHR to use margin of appreciation in order to help maintain the Court’s authority. For, unlike a national court whose judgements can be enforced by the police, the ECHR depends upon voluntary compliance of the member states of the EU. The numerous and emphatic third-party interventions will have reinforced this point with the ECHR justices. It was clear that the final ruling of its Grand Chamber would have to reflect this. As one legal expert warns, “there is a serious question whether the application of the doctrine is consistent with the idea that human rights treat individuals as central, giving them "rights" as against the principal subjects of international law, the states.”  In other words, margin of appreciation has the potential to undermine the human rights of individuals by upholding the rights of groups. After querying the extraordinary and unprecedented reversal of a unanimous decision of the lower court, I was told that Italian diplomats had visited senior officials in a member state, encouraging them to put pressure on the European Court to reverse the decision by threatening to withdraw funds if they failed to do so. This was apparently part of a tour of states by the diplomats and presumably failure to co-operate would have been regarded as damaging bilateral relations with Italy. In retrospect how else could such an extraordinary reversal have been achieved? 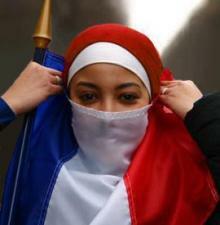 She speculated that the Court's "timid approach" may be partly explained by the rise in Euroscepticism. Be that as it may, this judegment could be seen as further eroding the primacy of human rights. ECHR survival at the cost of watering down human rights judgements? Putting the judges on the defensive is proving to be an effective way of eroding their ability to uphold human rights. Crucifix in classrooms: Contrary to parents’ right to educate their children in line with their convictions and to children’s right to freedom of religion. 4. Grand Chamber, ECHR, Case of Lautsi and others v. Italy, 18 March 2011, §70. 6. Grand Chamber, ECHR, Case of Lautsi and others v. Italy, 18 March 2011, §56. 7. Quoted in Bakircioglu, p. 714. Before the 1962 education concordat it had been left up to each Austirian school to decide whether or not to hang a crucifix in the classrooms. 20. “Poland ‘worried’ by Court school crucifix ban”, Javno, 3 December 2009. 21. “Slovak parliament objects to European court ruling on religious symbols”, Slovak Spectator, 11 December 2009. 23. “Green light for Draft Protocol 15 to the European Convention on Human Rights by the Legal Affairs Committee”, Parliamentary Assembly Council of Europe (PACE), 20 March 2013. 24. Yutaka Arai-Takahashi, The Margin of Appreciation Doctrine and the Principle of proportionality in the Jurisprudence of the ECHR, 2001, p. 227. 27. David Hart QC, "ECtHR judge ponders on EU/ECtHR dogfight, and recent trends of timidity in the ECtHR", UK Human Rights Blog, 6 October 2015.